Are you unable to find the perfect data-driven content marketing strategy for your business? Drive more conversions and build a successful business with the Crux Creative Solutions. According to experts, no online Business can survive in this competitive digital world without an effective content marketing strategy. It not only allows you to build consumer trust, but also increases your interaction with the audience. At Crux Creative Solutions, a creative digital marketing company in Gurgaon, we have experienced that content marketing strategy performs extremely well when they are made after analysing fresh and reliable data. A data-driven content strategy is very effective as it saves time and helps in delivering content to the right audience at the right time. Here are some tips for preparing the data-driven content strategy of the leading digital marketing company in Gurgaon. Start researching on your audience as much as you can, it is extremely beneficial for the data-driven content strategy. Use Google Analytics or other analysis tools to understand the needs and preferences of your target audience. You should know the following things about your target audience before creating a content strategy. What kind of information they like? As a top digital marketing company in Gurgaon, we always dig the data related to demographics, behaviour, and preferences of our target audience. These kinds of data help you in understanding what kind of content your audience will like, what is their preferred channel, and what are their buying habits. Website Analysis: Look, creating a strategy means, understanding the problems, find the solution and implement it on your project. Do a detailed SEO analysis of your website, find where you are lacking, and then create a perfect content strategy for your growth. Content Analysis: It involves finding the new trending topics and content types for the blog, social media, and websites. Moreover, you should analyse those contents that have earlier performed well. This gives you an idea about what your audience likes and what they do not like. Keyword Analysis: Collect as much data as you can about the trending keywords. Analyze which keywords on your website are ranking and which keywords are not ranking. Doing this will help you with diagnosing the problem! As an experienced digital marketing company in Gurgaon, we can say that analysing all these factors can lead you to a perfect content strategy. After gathering all the data related to your audience, choose the best-suited content type for your platform. For example, if your data shows that your audience is more interested in Infographics, then create Infographics. Remember following things to include in your content to make it attractive and clear. How much time did people spend on your website? How many are new and repeat visitors to your website? Analyze the level of engagement and make changes according to its. Use an analytics tool to calculate the ROI and profits of your business. If the result in all the cases is positive, then your strategy is working. You need to keep working on it! 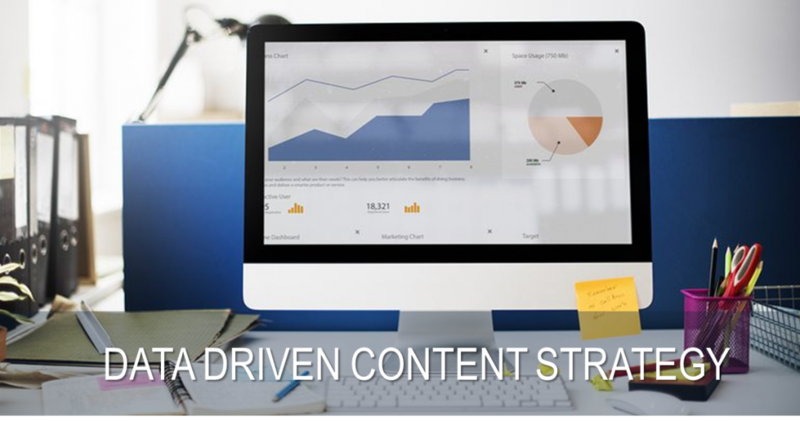 Creating an effective data-driven content marketing strategy is a daunting task to do. Not everyone can quickly learn to create effective strategies; it requires long research and study on the audience, keywords, content, etc. Therefore, if you are unable to find the perfect content strategy for your business, then call us today!